Background: The frequency of haemorrhage in individuals with hereditary haemorrhagic telangiectasia (HHT), 10% of whom will have cerebral arteriovenous (AV) malformations, could be high enough to justify screening. This would allow presymptomatic treatment to prevent early onset stroke in a condition that affects at least 1 in 8000 individuals. This is an important issue in view of the contrast between transatlantic management approaches, the worldwide dissemination of patient information, and the ethical implications of the diagnosis for the untreated patient. Objectives: To define the annual incidence of haemorrhagic stroke in individuals with HHT. Methods: Retrospective study on stroke incidence in individuals with HHT and their immediate families (n = 674; 22 061 HHT patient years), specifically analysing patients under 46 years of age (17 515 patient years). The results were compared with stroke risk in the general population. Results: In the majority of cases, the haemorrhage was the first significant neurological event. Overcorrecting for any bias towards overestimation that would be introduced in excluding non-penetrant family members, cerebral haemorrhages were more than 20 times more common in male HHT subjects under the age of 45 years than in the general population (standardised ratio 22.99; 95% confidence interval, 13.14 to 37.33). 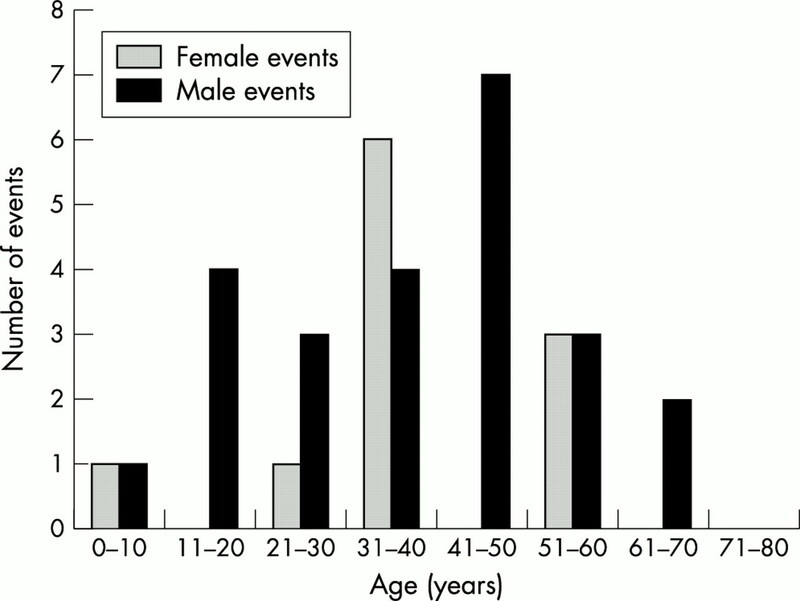 Haemorrhages were also six times more common in female HHT subjects (6.18; 2.27 to 13.45). The incidence ratio of cerebral haemorrhage in male patients (1.84; 1.05 to 2.99) yielded a haemorrhage rate in individuals with cerebral AV malformations of 1.4–2.0% per annum, comparable to figures in the non-HHT cerebral AV malformation population. Conclusions: These data contradict accepted wisdom in many countries that asymptomatic HHT patients are at a low (and acceptable) risk of haemorrhage. The data justify a more aggressive screening approach to identify small causative lesions amenable to treatment. The vascular condition hereditary haemorrhagic telangiectasia (HHT, Osler-Weber-Rendu syndrome) is not a rare disease. Recent careful epidemiological surveys suggest incidences greater than 1 in 2500 in regions of France,1 1 in 6400 in Denmark,2 and 1 in 5–8000 in Japan.3 The disease is classically recognised by the triad of epistaxis, mucocutaneous telangiectasia, and a family history, but the importance of visceral involvement (other than gastrointestinal haemorrhage exacerbating iron deficiency anaemia) is often overlooked.4 Arteriovenous (AV) malformations occur commonly in the pulmonary, cerebral, and hepatic circulations, and less often in spinal, renal, and other circulations.5,6 The importance of pulmonary AV malformations, which place individuals at high risk of embolic cerebrovascular events including cerebral abscess, and which affect at least 30% of HHT patients,7,8 is being increasingly recognised. As a result, screening for pulmonary AV malformations and presymptomatic treatment programmes have been widely introduced. We have attempted to define the risk of cerebral haemorrhage in patients with HHT by recording the incidence in a large cohort of HHT patients in the United Kingdom and, to exclude any bias in non-ascertainment, in complete generations of their immediate families. To compare our results to those of the general UK population, we used the data from the Oxfordshire community stroke project,16 which have been validated against similarly well executed large incidence studies in other populations.17 While we recognise the limitations of a retrospective study, in this rare group of patients such data will be extremely difficult to obtain prospectively. We believe our data justify the consideration of screening and potential intervention for asymptomatic patients with HHT. With ethical approval (LREC 00/5792), all available case notes of patients seen in an HHT clinic held at the Hammersmith Hospital between 1988 and 1 May 2000 were examined. Supplementary information was obtained by contacting relevant individuals and local physicians. Individuals were included in the study if, during hospital review or ethically approved research study assessment, one first degree relative had a definite diagnosis of HHT and information on all members of their generation was available. Although the probands for these studies attended the Hammersmith Hospital HHT clinic, the majority of family members had not sought medical care regarding HHT. Sixteen families were excluded because the original case notes were unavailable or incomplete. We documented all strokes from all causes (excluding transient ischaemic attacks) and the age of the individual at the time of the event. Strokes were included as definite cerebral haemorrhagic events if they were proven by lumbar puncture, imaging, or necropsy examination (n = 14); if a catastrophic fatal event was immediately preceded by a severe headache (n = 2); or if it was stated on the death certificate in cases where the original medical records had been destroyed (n = 9). Data on three events initially described as haemorrhagic are still awaited; these events are included as likely haemorrhages in our final analysis. Where patients had more than one cerebral haemorrhage, only the first was recorded, as it is accepted that the risk of rebleeding is greater than for a first haemorrhage.10,14,15 Cerebrovascular events that did not meet these criteria were assigned to the groups of cerebral abscess (clearly apparent from the distinct medical presentation and management) or “other, presumed embolic”. In the vast majority of cases, exact ages were known. In instances where family members did not have exact ages or dates of birth specified, an estimate was made of the member’s likely age range, to overcome the bias that would have been introduced by excluding such family members (details of these estimates are available from the authors). In many cases there was molecular confirmation of affected or unaffected status from our ongoing molecular studies. Where clinical diagnosis alone was available, classifications were done in accordance with international consensus criteria, based on the four diagnostic criteria of epistaxes, telangiectasia, visceral manifestation, and an affected first degree relative. The presence of three of the four criteria defines “definite” HHT.4 As the symptoms and signs of HHT develop with age, many but not all of the patients with “suspected” HHT (two criteria), and some of the patients in whom the diagnosis was “unlikely” (one criterion) would have inherited the HHT gene from their affected parent. If we included only those individuals with a firm diagnosis of HHT in the study, we would introduce a bias in calculations and overestimate the true incidence of cerebral haemorrhages in the HHT population. We therefore used published data on penetrance in HHT to calculate for each individual according to their age the probability that they were affected by HHT, and therefore the number of “HHT affected years” (= probability of HHT affected status × age in years) they could contribute to the final figures (details available from the authors). Ninety eight families providing a total of 674 individuals (mean family size 6.88) met the criteria for inclusion, comprising 332 male subjects (average age 42.3 years) and 342 female subjects (average age 43.2 years) (table 1). The individuals in the study contributed a total of 22 061 ± 1542 “HHT years,” and 17 515 years (+206, −756) up to the age of 45 years. Seventy per cent of the population (474/674) were able to contribute at least 95% of their age to “patient years”. Seventy five strokes of all causes were recorded for all individuals in the study, 45 occurring in male subjects and 30 in female subjects (tables 2 and 3). The mean age at the event was 41.6 years for the male population and 40.0 years for the female population. The 75 strokes included 22 cerebral abscesses and 18 presumed embolic strokes. The high frequencies of these embolic strokes results from paradoxical embolism through pulmonary AV malformations (which affect at least 30% of HHT patients, and women approximately 1.6 times more often than men6). The annual risk of any stroke per HHT year was 4.11 per 1000 population/year (95% confidence interval (CI), 3.81 to 4.45) for male subjects and 2.70 (2.54 to 2.87) for female subjects (table 4). Twenty eight strokes met the strict criteria for cerebral haemorrhage, with a further seven events in the likely haemorrhage group (fig 1, table 3). (It is also likely that the “other, presumed embolic” group also included further haemorrhagic strokes, in particular two deaths during sleep, and two pregnancy related strokes in patients aged 18 to 36 years.) The mean ages of definite haemorrhage were similar in male and female subjects (37.4 years and 37.8 years, respectively). However, the majority of female definite and probable haemorrhages occurred during the child bearing years (7/11, 63%), whereas in the male subjects, the spread was more even from childhood to old age. Based on the definite haemorrhages, the annual risk of a cerebral haemorrhage was 1.73 per 1000 population/year (95% CI, 1.61 to 1.88) for male subjects and 0.81 (0.76 to 0.86) for female subjects (table 4). In contrast to studies in the general population, the bulk of the strokes occurred in individuals aged under 45 years, affecting 34 of the 98 families studied. The incidence ratio (representing the rate per 1000 population/year) was 4.11 (95% CI, 3.81 to 4.45) in male subjects and 2.70 (2.54 to 2.87) in female subjects. In this age group, 22 strokes met the strict criteria for cerebral haemorrhage, with four further probable haemorrhages. Using the strict criteria, the incidence ratio for cerebral haemorrhage was 1.84 (1.05 to 2.99) in the male population and 0.68 (0.25 to 1.48) in the female population. It was possible to compare directly the annual risk of an individual suffering a cerebral event under the age of 45 years with the risk for the general population. In the Oxfordshire community study, the risk of cerebral event (nature of stroke unspecified) in the general population was estimated to be 0.09 (95% CI, 0.06 to 0.13) per 1000 population/year for all individuals, 0.08 (0.03 to 0.12) for boys and men, and 0.11 (0.06 to 0.16) for girls and women.16 The standardised ratios illustrated in table 5 indicate that for all subjects and for every type of stroke, the lower boundary of the confidence interval is greater than 1, thus giving strong evidence of a significant difference between the HHT and normal populations. The standardised ratio of definite cerebral haemorrhage was 22.99 (13.14 to 37.33) for male subjects and 6.18 (2.27 to 13.45) for female subjects. Our population of patients suffering cerebral haemorrhagic events included some who were already experiencing headaches and other symptoms, particularly younger men (table 1). However, only three individuals had sufficient pre-existing symptoms to bring them to neurological attention (and in one of these, the migrainous headaches were not improved by surgical resection of the AV malformation responsible for the cerebral haemorrhage). We carefully considered the question of a potential overlap with families with pulmonary AV malformations, as there have been anecdotal suggestions that cerebral AV malformations are more common in families with pulmonary AV malformations.5 There was a definite trend towards an increase in families with pulmonary AV malformations, as individuals in 28% of HHT families with such malformations (20/71) had a cerebral haemorrhage, compared with 11.1% (3/27) of HHT families without pulmonary AV malformation. However, this trend did not reach statistical significance at the 5% level (χ2 = 3.17; p = 0.08). We have shown that men and women with HHT have a significantly increased risk of stroke, and a six- to 22-fold increased risk of cerebral haemorrhage under the age of 45 years. Our key findings are that the haemorrhage rate resembles that of the non-HHT cerebral AV malformation population more than had previously been suggested, and for many patients, the haemorrhage was the first significant neurological event. Even with our considerable bias towards underestimation, our results indicate that the risk of haemorrhagic stroke in all male HHT patients under the age of 45 is 0.2% per annum (95% CI, 0.105% to 0.327%), approximately double the rate observed in women. The quoted risk for first onset haemorrhage from a cerebral AV malformation in non-HHT populations is approximately 2% per annum (1.3% to 3.9%).10,12–15 Assuming that the majority of the cerebral haemorrhages in our cohort resulted from cerebral AV malformations, and that the incidence of these malformations is 10–14%7, our data for male HHT patients under the age of 45 years would represent a haemorrhagic risk of between 1.4% and 2.0% per annum per patient with a cerebral AV malformation, in keeping with the 1.3% to 3.9% per annum risk quoted for first onset haemorrhage from this cause in non-HHT populations. The major strengths of our study are that it involved a sample representative of almost 10% of the total United Kingdom population of individuals with HHT, without bias towards neurologically symptomatic patients (only a single patient in our series had seizures), and was amenable to comparison with the well validated “normal” United Kingdom population from which our sample was drawn. Furthermore, our methodological biases would have led to an underestimate of the magnitude of the significance of the results of this study population. First, it is possible that some cases of cerebral haemorrhage in relatives were not reported by, or known to, the index cases. However, for such individuals, their years of life were included even if there was scanty medical evidence to exclude stokes in the individual. Second, our relatively strict criteria mean that further cerebral haemorrhages may have been missed as unspecified “stroke”. Third, we assigned all first degree family members one Curaçao diagnostic criterion4 so they all contributed a proportion of their age to the denominator of total HHT patient years. Seventy per cent of individuals (474/674) contributed at least 95% of their age (although only 298 (1.4%) patient years were contributed by individuals with “unlikely” HHT). Potential weaknesses of our study include its retrospective nature, the limited angiographic details, and, although the cohort was unselected after presentation to the Hammersmith Hospital, the pulmonary AV malformation referral bias of our centre. However, at least 30% of HHT patients have pulmonary AV malformations,7,8 and with an average family size of 6.7, the ratio of 71 families with pulmonary AV malformations to 27 families without in our study is within the expected range. Our results differ from those of other studies that have quoted lower risks of haemorrhage in Dutch20 and American21 HHT populations. A higher proportion of symptomatic patients is unlikely to account for the difference as only a single patient in our series had seizures, in contrast to four of 24 (17%) in the Dutch study (in which a haemorrhagic risk of less than 1% per annum was quoted).20 We believe the difference lies in the facts that these other studies did not span the outcome over the patient’s whole life, included older patients in whom cerebral AV malformations may have been selected out by earlier fatal haemorrhages, and only addressed haemorrhages in the surviving cohort in whom cerebral AV malformation had been diagnosed. For example, in the Dutch study,20 all of the three haemorrhages included occurred in patients aged 45 or less, and one proven haemorrhagic patient was excluded because intravenous digital subtraction angiography was negative. We conclude that these studies have underestimated the true risk of cerebral haemorrhage in the respective HHT populations. In addition, it should be noted that the cerebral haemorrhage in one of our patients at the age of 22 years resulted not from a cerebral AV malformation but from aneurysms, which were later surgically treated. This means we cannot exclude the possibility that HHT patients are also at risk of cerebral haemorrhages from causes other than AV malformations, which are potentially remediable. It is interesting to note the unexpected excess haemorrhage rate in male compared with female subjects, and that the majority of haemorrhagic events in women occurred during the child bearing years, in some cases associated with pregnancy and parturition. As these observations are unlikely to reflect a higher incidence of cerebral AV malformations in women,20 altered vascular wall, haemodynamic, or haematological profiles may be contributing and would be worthy of further study. Our data also indicate that cerebral haemorrhage is statistically more common in men under 45 years of age than non-haemorrhagic, non-abscess strokes, even in a population potentially biased towards pulmonary AV malformations and specifically at risk of embolic stroke because of paradoxical embolism through the abnormal pulmonary vessels. Should we screen members of HHT families for the presence of cerebral AV malformations? This is the pertinent clinical question that this study was designed to address. The devastating effects of many of the cerebral haemorrhages, particularly in children and pregnant women, provide an emotional push towards a screening and presymptomatic intervention programme in HHT. Certainly, there is every justification to manage the symptomatic HHT patient aggressively as there are no data to suggest that such patients are different from symptomatic non-HHT patients, for whom a haemorrhagic risk of 1.3–3.9% per annum is quoted. Screening with a view to presymptomatic intervention can only be justified, however, if the risk reduction by intervention significantly outweighs any procedural morbidity. Whereas permanent neurological sequelae resulting from emboli associated with pulmonary AV malformations are exceptionally rare in experienced hands,22 the potential treatments for cerebral AV malformations carry much greater hazards for the majority of patients, and the best treatment outcomes are obtained by individualised interdisciplinary care from dedicated vascular neurosurgeons, neuroradiologists, and radio-oncologists. For each of the treatment options (surgical excision, obliteration by radiotherapy, or endovascular intervention) there are different methodological approaches, with attendant risks depending on the inherent risks of the treatment approaches and their impact on the topographical location of the lesions. Surgical risk depends on the ability to excise the lesion without damaging the normal brain and its normal circulation. Surgical extirpation of solitary low Speizler–Martin grade AV malformations (that is, small size, superficial venous drainage in non-eloquent areas) carries small risks, with mortality approaching 0% and cure rates of up to 94–100%,23,24 whereas mortality may be as high as 20% for midbrain AV malformations.25 For nidus radiotherapy (which at best cures only 65–85% of patients24), quoted mortality is in the region of 3%.23 The risks of endovascular occlusion using cyanoacrylate glue depends on the experience and skill of the radiologist, and may approach 6%.26 In addition to concerns regarding the intrinsic risk of the interventional procedure, many of these approaches are unable to obliterate the target abnormality completely. This leaves the hypothetical situation in which the actual risk to the patient for serious neurological damage may not be reduced. Furthermore, only a proportion of patients will have lesions amenable to safe and complete removal or occlusion, and the argument may be countenanced that these lesions are less likely to bleed. In this case, one option would be to obtain additional natural history data based on anonymous screening programmes to observe whether smaller, accessible lesions posed haemorrhagic risks as high as other AV malformations, for which any intervention would carry a high morbidity. However, the practical obstacles to achieving this are formidable, and the HHT population is already well informed about the possible risks of cerebral AV malformations from published reports and often from their own family histories. With the data currently available, we believe that to deny patients with small amenable cerebral AV malformations the benefits of modern therapeutic practice challenges ethical considerations as strongly as informing patients of a diagnosis which may alter their lifestyle and their insurance ratings. In summary, we highlight the fact that the HHT population includes a group of children, teenagers, and young adults at high risk of haemorrhagic stroke. We show that the risk of haemorrhagic stroke is higher than previously documented, particularly in young male subjects. Based on available risk–benefit analyses, we believe the data provide compelling reasons to screen asymptomatic HHT patients to identify the subgroup with cerebral AV malformations or other lesions likely to be amenable to treatment, in whom risk reduction may be achieved. This may be particularly important for individual women and girls from families with pulmonary AV malformations. Any such programme would need to be accompanied by honest discussions with the patients concerned. All potential scenarios of screening outcomes would need to be discussed to ensure that the individual would consider interventional options, were these to be recommended by an appropriate dedicated multidisciplinary vascular team, but would be confident that, were no treatment to be recommended, they would be prepared to live with their cerebral AV malformation. We thank Dr Paul Bassett, Statistical Consultancy Service, Department Epidemiology and Public Health, Imperial College School of Medicine, for the statistical analyses, and Professor Richard Wise and Dr Robert Shiner for helpful discussions and manuscript review. CLS was supported by the Wellcome Trust and British Heart Foundation. Bideau A, Brunet G, Heyer E, et al. An abnormal concentration of cases of Rendu–Osler disease in the Valserine valley of the French Jura: a geneological and demographic study. Ann Hum Biol1992;19:233–47. Kjeldsen AD, Vase P, Green A, Hereditary hemorrhagic telangiectasia (HHT): a population-based study of prevalence and mortality in Danish HHT patients. J Intern Med1999;245:31–9. Dakeishi M, Shioya T, Wada Y, et al. Genetic epidemiology of hereditary haemorrhagic telangiectasia in a local community in the northern part of Japan. Hum Mutat2002;19:140–148. Shovlin CL, Guttmacher AE, Buscarini E, et al. Diagnostic criteria for hereditary haemorrhagic telangiectasia (Rendu–Osler–Weber syndrome). Am J Med Genet2000;91:66–7. Guttmacher AE, Marchuk DA, White RI. Hereditary hemorrhagic telangiectasia. N Engl J Med1995;333:918–24. Shovlin CL, Letarte M. Hereditary haemorrhagic telangiectasia and pulmonary arteriovenous malformations: issues in clinical management and review of pathogenic mechanisms. Thorax1999;54:714–29. Haitjema T, Disch F, Overtoom TTC, et al. Screening family members of patients with hereditary haemorrhagic telangiectasia. Am J Med1995;99:519–24. Kjeldsen AD, Oxhøj H, Andersen PE, et al. Pulmonary arteriovenous malformations: screening procedures and pulmonary angiography in patients with hereditary hemorrhagic telangiectasia. Chest1999;116:432–9. Fulbright RK, Chaloupka JC, Putman CM, et al. MR of hereditary hemorrhagic telangiectasia: prevalence and spectrum of cerebrovascular malformations. Am J Neuroradiol1998;19:477–84. Graf CJ, Perrett GE, Torner JC. Bleeding from cerebral arteriovenous malformations as part of their natural history. J Neurosurg1983;58:331–7. Perret G, Nishioka H. Arteriovenous malformations: an analysis of 545 cases of cranio-cerebral arteriovenous malformations and fistulae reported to the cooperative study. In: Sahs A, et al, eds. Intracranial aneurysms and subarachnoid haemorrhage: a co-operative study. Philadelphia: JB Lippincott, 1969:200–22. Crawford PM, West CR, Chadwick DW, et al. Arteriovenous malformations of the brain: natural history in unoperated patients. J Neurol Neurosurg Psychiatry1986;49:1–10. Brown RD, Wiebers DO, Forbes G, et al. The natural history of unruptured intracranial malformations. J Neurosurg1988;68:352–7. Itoyama Y, Uemura S, Ushio Y, et al. Natural course of unoperated intracranial arteriovenous malformations: study of 50 cases. J Neurosurg1989;71:805–9. Ondra SL, Troupp H, George ED, et al. The natural history of symptomatic arteriovenous malformations of the brain: a 24-year follow-up assessment. J Neurosurgery1991;73:387–91. Bamford J, Sandercock P, Dennis M, et al. A prospective study of acute cerebrovascular disease in the community: the Oxfordshire Community Stroke Project 1981–1986. Methodology, demography and incident cases of first ever stroke. J Neurol Nurosurg Psychiatry1988;51:1373–80. Bonita R, Beaglehole R, North JDK, Event, incidence and case-fatality rates of cerebrovascular disease in Auckland, New Zealand. Am J Epidemiol1984;120:236–43. Daly LE, Confidence limits made easy: interval estimation using a substitution method. Am J Epidemiol1998;147:783–90. Breslow NE, Day NE. Statistical methods in cancer research – the analysis of case–control studies. Lyon: International Agency for Research on Cancer;1980;1:124–46, 169–82, 192–246. Willemse RB, Mager JJ, Westermann CJJ, et al. Bleeding risk of cerebrovascular malformations in hereditary haemorrhagic telangiectasia. J Neurosurg2000;92:779–84. Maher CO, Piepgras DG, Brown RD, et al. Cerebrovascular manifestations in 321 cases of hereditary haemorrhagic telangiectasia. Stroke2001;32:877–82. Gupta P, Mordin C, Curtiss J, et al. PAVMs: effect of embolisation on right-to-left shunt, hypoxaemia and exercise tolerance in 66 patients. Am J Roentgenol2002;179:347–55. Pikus HJ, Beach ML, Harbaugh RE. Microsurgical treatment of arteriovenous malformations: analysis and comparison with stereotactic radiosurgery. J Neurosurg1998;88:641–6. Fleetwood IG, Steinberg GK, Arteriovenous malformations. Lancet2002;359:863–73. Maraire JN, Awad IA. Intracranial cavernous malformations: lesion behaviour and management strategies. Neurosurgery1995;37:591–605. Henkes H, Nasher H-C, Berg-Dammer E, et al. Endovascular therapy of brain AVMs prior to radiosurgery. Neurol Res1998;20:479–92. Fisher WS, Decision analysis: A tool of the future: an application to unruptured arteriovenous malformations. Neurosurgery1989;24:129–35.